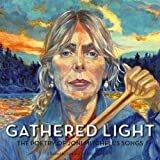 Gathered light : the poetry of Joni Mitchell's songs / edited by Lisa and John Sornberger. Contributor(s): Sornberger, Lisa [edt] | Sornberger, John [edt]. Material type: TextPublisher: Toronto : Sumach Press, cop. 2013Description: [232 str.] ; 23 cm.ISBN: 9781927513125.